This electronic accessories bag portable travel organizer case storage is specifically designed for well organized people. Exterior material is made of heavy-duty, durable and waterproof PU leather, internal mesh pockets protect your electronics accessories. Adjustable padded dividers allow you to design your own internal structure for difference electronics accessories. One internal zippered mesh pocket for small items, strong handle for easy carrying. 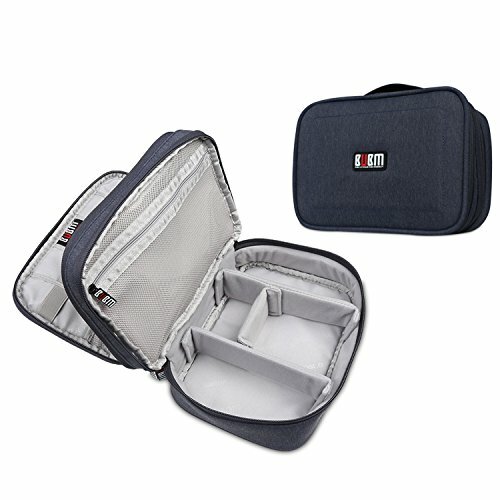 This travel organizer case helps make you better organized with all the small electronics items and gadgets. The portable storage carrying bag can hold the power chargers for the Mac Book Pro, the iPad, the iPhone, all the variety of cables for the hard drives, all the SD cards and readers and hard disk, etc. BUBM pursues the best quality of all of our products and devotes to providing the best product and service to customers. If any question, please contact us, we will reply you within 24 hours. Considerate Design:The 3 detachable padded dividers allow you to customize the space to store your gadgets.Padded dividers can offer excellent protection for your gadgets.zippers closure ensure your item secure. Large Capacity:Enough space for your electronic accessories, Mesh pockets and elastic loops to hold various items like cables, flash disk, USB drive, Power, Charger, Passport, Cashes, Headphone and etc.The middle mesh pocket can fit smartphones,a Kindle,or an iPad Mini. Multifunction: Can be used as a travel electronic accessories storage bag, business bag, make-up organizer bag, work bag, first aid bag and etc. Travel Companion:Perfect size for most of the backpacks and luggage. It has a handle for carrying easily.Perfect companion for your electronics accessories when going on holiday, business trip, travel, office, school. Best gift for your family and friends.